Westerns have been out of favor for the better part of the last forty years. Since the early 80's there haven't been many Westerns made that saw theatrical release. Texas Rangers is barely one of them. Playing on a total of only 404 screens, Texas Rangers has a short theatrical run that went largely unnoticed. That's not surprising given the delays in the film's release (almost two years). The confidence in Texas Rangers shown by Dimension and Miramax was less than staggering, which is why the movie was delayed time and again. But is the movie really all that bad? No, not at all. Sure, there is absolutely nothing new under the sun here, nor is there a lot of character development. This was a modern take on the 1930's Western, an era where it was the good guys versus the bad guys and there wasn't much more to it than that. Even so, Texas Rangers is fairly entertaining. Flawed, but entertaining. The attempt by Dimension and Miramax to recreate the formula used in Young Guns didn't even begin to pay off at the box office, and to a degree it hurt the quality of the film itself. James Van Der Beek from Dawson's Creek actually acquits himself nicely in his role as an intellecutal Easterner caught up in the cattle raids in southern Texas. Van Der Beek delivers a fairly strong performance, which is much more than could be said for Ashton Kutcher of That 70s Show. Kutcher is clearly miscast in a Western. His performance makes it seem like he thought he was in That Western Movie, instead of a legitimate Western. He isn't able to restrain himself from falling into the character of Michael Kelso at times here, and that does hurt the movie. On the other hand, Dylan McDermott gives a strong performance as the Captain of the newly reformed Rangers, Leander McNelly. McDermott's stern, strong presence gives some weight and crediblity to the movie, and that, combined with Van Der Beek's performance (as well as those of Randy Travis and Robert Patrick), overcomes the deficiencies of Kutcher. Also giving a fairly strong performance was Rachel Leigh Cook as the daughter of a powerful rancher. But what about the story? Like I said before, it's the good guys versus the bad guys. The outnumbered Texas Rangers against the bandits who are stealing cattle by the hundreds of thousands and killing dozens of people who get in their way. Alfred Molina plays the leader of the bandits, and while Molina is an exceptional actor in the right role, here he is merely good. He's credible, which is all this movie really needs and all that the role called for. 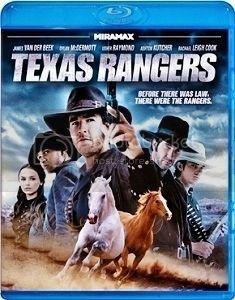 In the end, Texas Rangers is a tightly told story that has some exciting shootout battles and some great scenery. There is nothing new under the sun (or on the Rio Grande) here, but, aside from Kutcher's miscasting, nothing horrible, either. 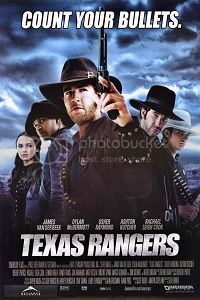 Texas Rangers is a diverting movie that delivers some entertainment value.